Most of the ancient civilizations of Mesoamerica such as the Olmec, Maya, Mixtec, Zapotec and Aztec cultures practised some kind of taking of human trophies during warfare. Captives taken during war would often be taken to their captors’ city-states where they would be ritually tortured and sacrificed. These practices are documented by a rich material of iconographic and archaeological evidence from across Mesoamerica. Today I added some info to that article. In the South West of Mexico there are various pre-Columbian figures in which high-ranking characters, warriors and ball players wear ritual and military paraphernalia, holding inverted heads with their loose, long hair hanging down. One of these figures can be seen in the National Museum of the American Indian in Washington (see drawing below). Javier Urcid writes that these trophies may have been “soft parts of decapitated heads turned into relics to hang.” There are also several figures showing characters with facial skin on their face: the skin of a flayed human. Urcid’s article in El Sacrificio Humano en la Tradición Religiosa Mesoamericana includes several illustrations of these trophies in the southern west of Mexico, including a brazier depicting a ball player with a flayed facial mask, wearing a necklace of human bones and carrying a severed head. Sometimes it is not even necessary to add value judgments about such practices. A simple enumeration of the facts is enough. More info about this cute ritual, the tlacaxipehualiztli, performed by these little angles that were the pre-Hispanic Amerinds appears in my book. Keep in mind that the tlacaxipehualiztli was performed every year before the Spanish conquest. Eduardo Matos Moctezuma is a prominent Mexican archaeologist that has directed excavations at the Great Pyramid of Tenochtitlan. In his article “La Muerte del Hombre por el Hombre” in El Sacrificio Humano en la Tradición Religiosa Mesoamericana (pages 43-64), he includes fifteen illustrations of ancient codexes, of which I’ll reproduce only a couple of them. I don’t want to repeat what I already said about pre-Hispanic human sacrifice in The Return of Quetzalcoatl. I want to add something new. And since art is the royal road to enter the soul of a totally alien culture, I find it convenient to include these images of how the books authored by the representatives of the high culture in the Amerind world looked like before they were conquered by the white man. The above is a highly-pixelated image. Click on it to see the details (click again for even more detailed close-up). I may be no expert in deciphering such codexes but a central image on the left page looks like a grey-faced man holding a decapitated head with blood pouring under it. Recently I was in the bookstore of the Museo Nacional de Antropología (MNA), which I had not visited for years, and the cover of a DVD for sell caught my attention. Although it was about human sacrifice in pre-Columbian America, the back cover of this BBC documentary claimed that “women had more rights” in the pre-Hispanic world than in the West. I immediately put the DVD, which before reading that had tempted me to purchase it, back to the shelf. In my chapter of Hojas Susurrantes dealing with the Aztecs I did not include references because the format of that chapter is literary, not academic. But now that I was in the MNA I obtained a copy of what could be regarded as the most up-to-date academic work on human sacrifice in Mesoamerica. El Sacrificio Humano en la Tradición Religiosa Mesoamericana is a 600-page, academic treatise authored by 28 scholars on the subject of pre-Columbian sacrifice: Mexican, European and American archeologists, historians and anthropologists. Published in 2010 by both the Instituto Nacional de Antropología e Historia (INAH) and the National Autonomous University of Mexico (UNAM), this can be the ultimate source to validate what I wrote in my book about the Aztecs. In addition to the sources I already knew, El Sacrificio Humano includes some new archeological evidence corroborating the 16th century claims of the Spaniards about Amerind infanticide, sacrifice and cannibalism. Of course: the Mexicans who coordinated the publishing of this major work are politically-correct idiots whose main objective is that the readers continue to subscribe the non-judgmental ethos so fashionable in anthropology today, an ethos that takes Boasian anthropology as axiomatic. This can be gathered from the presentations to this collaborative work by the director of the INAH (“Accepting the reality of the sacrificial practices in ancient Mexico does not mean to rule in favor or against them”—my translation); those who coordinate the MNA (“…the Hispanist fundamentalism that sees only the most barbaric aspects of this practice”), and the director of the Institute of Historical Research of the UNAM (“…among the non-specialist public often circulates reductionist ideas about it [the Mesoamerican sacrifice]… the papers presented here allow a more accurate and nuanced approach”). Take note that these men and women and all Mexican and non-Mexican anthropologists and historians that contributed with academic papers to El Sacrificio Humano don’t deny the facts about what the pre-Hispanic Amerinds did. What modern academics do is, like their guru the Jew Franz Boas, abstaining from value judgments about such practices. In today’s historiography you can say everything you want against whites, the Germans and the Nazis, but even the slightest condemnation of non-white cultures is considered disloyal. In one of the first chapters after the above-mentioned presentations, the archeologist Eduardo Matos Moctezuma presents the archeological evidences of sacrificial rituals—skeleton remains of the victims, stony bases for the sacrifice, the instruments used in the immolations, etc.—that Leonardo López Luján, the main coordinator of the book, acknowledges in the very first chapter as “having their referents in the historical sources from the 16th century.” This scholar is thus acknowledging that what the Spanish chroniclers saw and recorded in the 16th century is now being corroborated by archeology. López Luján of course uses the passive voice, “fueron muertos” instead of the natural “los mataron” (they killed them) in that introductory chapter when writing about the sacrificial victims. 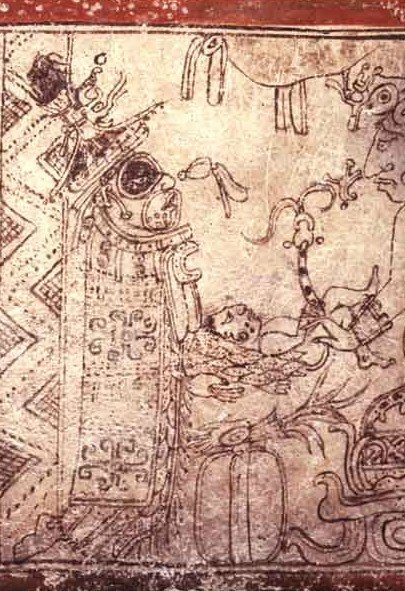 In the next entries of these new series I will be examining the naked facts that the scholars of El Sacrificio Humano present about how these little angels, the Amerinds, behaved before any substantial contact with the Europeans. Tenochtitlan, the world’s most beautiful city in the 16th century. For my interpretation of Aztec human sacrifice see my book: here.